I’d been looking to knit myself — finally — a Hogwarts scarf, but when I saw Neville’s house unity scarf on screen, I was so disappointed. The black background made the colors seem harsh, and the single bands of color didn’t even remotely match the charm of the paired stripes in the 3rd year scarves that I so love. 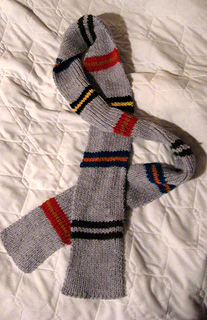 So this is the house unity scarf as I would have preferred to see it. It’s a bit of a secret handshake — any true Potter fan will recognize the color combination instantly, but to Joe Muggle on the sidewalk, it’s just an assortment of stripes keeping your neck warm.